On the sidelines of his official visit to Poland, Azerbaijani Foreign Minister Elmar Mammadyarov took part in the opening ceremony of a memorial plaque dedicated to the recognition of the independence of the Azerbaijan Democratic Republic (ADR) by the Republic of Poland in 1920, Azvision.az reports referring to the press service of the Foreign Ministry. The event was also attended by the Minister of Foreign Affairs of Poland Jacek Czaputowicz. Speaking at the ceremony, Elmar Mammadyarov noted the existence of historical ties between Azerbaijan and Poland, adding that, as a result of research conducted by the Azerbaijani Embassy in Poland, interesting documents on the relations between the two countries were found in Polish archives. In this context, Minister Elmar Mammadyarov brought to the attention that on February 13, 1920, the Polish Foreign Minister Stanisław Patek sent a telegram to the government of Azerbaijan, which expressed the recognition of the de-facto ADR by Poland. Moreover, it was noted that in 1918, Polish diplomat Waclaw Ostrowski was appointed as the diplomatic representative of Poland to Azerbaijan. Expressing his high appreciation of the activities of Polish diplomats with regards to Azerbaijan 100 years ago, Minister Elmar Mammadyarov stated that there are close ties between the two countries today, also noting the existence of strategic ties between the countries. Polish Foreign Minister Jacek Czaputowicz praised the opening of the memorial plaque. He stressed that Poland already actively supported the sovereignty of the states 100 years ago, and noted that this policy continues today. 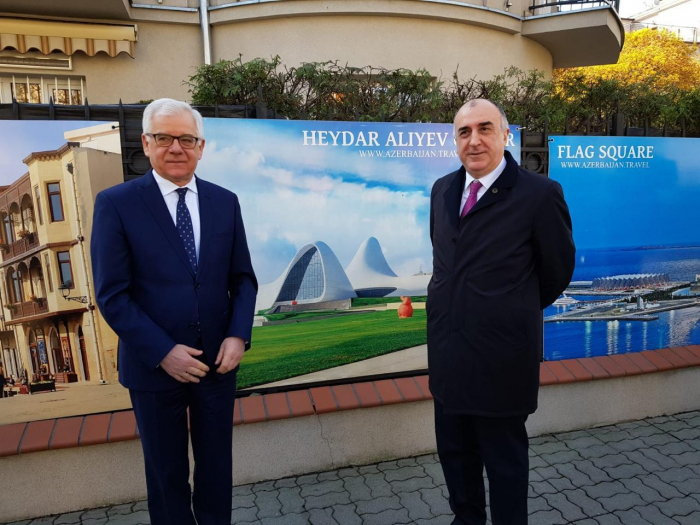 Referring to the contribution made by Polish specialists during the 20th century to the social and political life of Azerbaijan, the Polish minister highlighted oil production in Azerbaijan, the development of the architecture of Baku and other areas. The ministers stressed that a detailed exchange of views on the Azerbaijani-Polish relations will be continued during the bilateral meeting.